The Cosmic Pi project is a second attempt to build an Earth scale cosmic telescope. The project is supported by students and professionals on there own time at CERN. It is centered around a Raspberry Pi processor running a flavor of Linux and a Arduino DUE for some of the housekeeping chores. 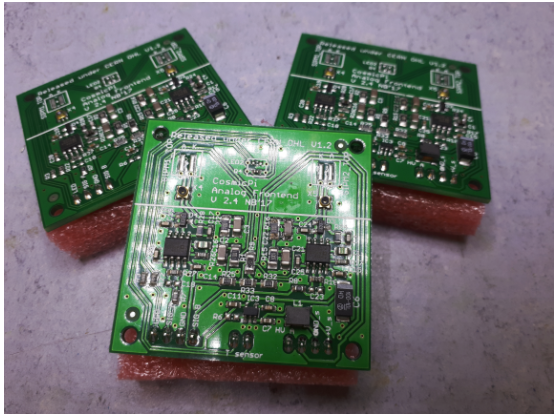 There design uses two Advansid ASD-NUV3S-P SiPM's and plastic scintillators and they are working on a coincidence detection system. They have some very good ideas for hardware modules and I plan to plagiarize them to the max. One of there advanced designs, uTelescope, uses 32 PIN diodes rather than the very expensive SiPM's but the design is not far enough along or me. Its worth watching. 32 PIN diodes at a few cents each is much better than SiPMs at about $100 each. Another problem is that for version 2 they plan to build the detection logic using a FPGA from Lattice semiconductor. While I love learning new things it seems to me that buying the necessary hardware and learning the development system and the language may be more than I care to tackle.